Parents are delivered into their empty nest in a multitude of ways, across different spans of place and time. Some run longingly, while others drag their feet. For most it’s a chance to reclaim your house and date night, while forging a new adult relationship with your children. Sadly, for others, it marks the end of a relationship that can no longer be sustained – a dissolution of a family under one roof. Whatever category you fall into, parents eventually see their empty nest as a new beginning. We are given different layers of life, each seasoned with a distinct flavor that may feel foreign to our palate at first. Initially, the empty nest is that strange inedible taste you swear you’ll never like. 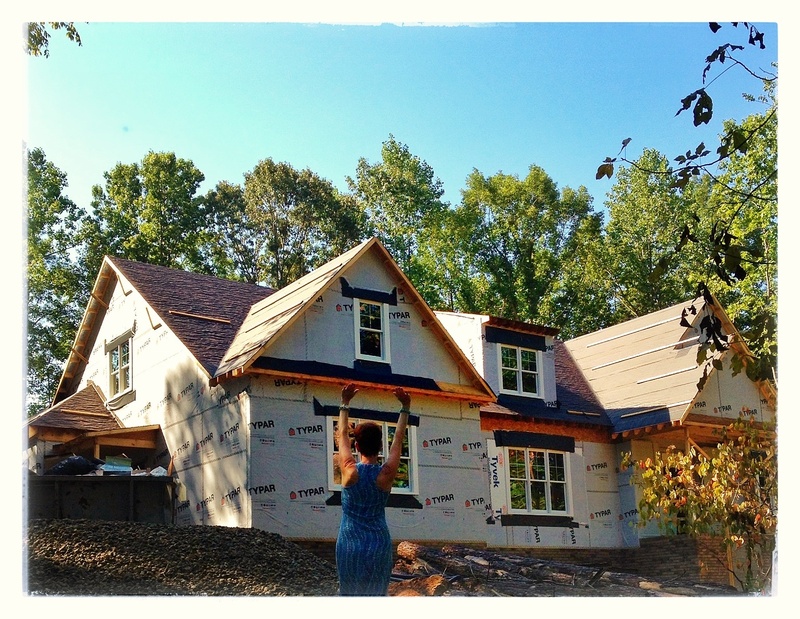 My husband, Sam, and I are in the midst of ‘Raising the Roof’ on our not so empty nest, a Craftsman style home near Richmond, VA. It’s a complete shift from the Williamsburg style homes we’d raised our two children in. Much of our life now, is a change of direction from where we were – literally and figuratively. In my last blogpost I mentioned our daughter, Samantha. I also spoke of vulnerability and being brave. Lessons in the art of being vulnerable and brave enough began in 1983 with the birth of our son. Other than the first two and a half years of marriage, my husband and I have never lived “the life we planned.” Who does. There was indeed, a different life waiting in the wings. A life altering game changer. Our first child, Preston, was born with hydrocephalus, which led to various developmental and health conditions – as the saying goes: I could write a book (stay tuned). For the purpose of this blog I will say that he had red hair, blue eyes, an amazing energy force and a great sense of humor. Oh, and yes, he had Cerebral Palsy and multiple disabilities. As game changers go, the year we sent our daughter off to college and became empty nesters in the most horrific way was unfathomable. Watching her car pull away we were met with an onslaught of emotions. As we walked back into the house I was floored by its quiet, empty feeling. How could it change so quickly? She’d left a thousand times before. I knew in my freshly wounded heart it was WHAT her leaving represented. She would never again come bounding through the door after a day at school, talking a mile a minute about the essentials in her world. Hanging out in the kitchen together while she grabbed a snack as I prepared dinner, remains one of my most cherished memories. We continued to talk about her new collegiate essentials over the phone. But it was the constant, the consistent, the up close and personal that comforted our hearts. I’m sure that if I had an audio playback of the weeks after Samantha left I would laugh a very heartfelt laugh at how sad I was, and how very far I’ve come. I thought of the early years when I craved five solitary minutes! When the Staples back-to-school commercial ran and I got so excited I would sing along as loudly as possible. It WAS the most wonderful time of the year! I did this while raising my hands in the air, making it clear to my kids that indeed, my cause for celebration was immeasurable! Now, as a veteran empty nester, I’m experiencing back to school through the eyes of the next generation of family and friends. Smiling soft smiles as I view posted photos, remembering how fleeting those years are. As the initial months of college and life passed, our family slipped into a comfortable rhythm to which we all moved. Preston continued to participate in his day program and loved being a greeter at various places in the community. Before we knew it Christmas break was upon us. Time to Raise the Christmas Roof! We were so excited to have everyone home for more than a fleeting weekend. I’d decked the halls with more than my usual ridiculous adornment of fresh greenery and multiple trees! Just days after Samantha’s arrival, the Grinch came in the form of a flu bug that found everyone but Sam. Our ideal family Christmas wasn’t starting out too well. Due to a pre-existing condition, Preston required a brief hospitalization. As I recovered at home, I spoke to the guys while they were in the ER. Preston was already feeling better, as treatment had begun. Sam put him on the phone, he sounded great. I told him – “I love you and I will see you tomorrow.” I secretly wished he’d be able to come home the following day. He died, peacefully, in his sleep, five days before Christmas. We had become a chapter in “the Storybook of Life.” The one you read and then say: I can’t imagine what I’d do if… I lost a child. We couldn’t either. One of our life compasses was gone. We were adrift in a black abyss. Vacant and damaged. Our roof had come crashing down on us. We crumbled inwardly into tiny little pieces. Jagged and misshapen. We hurt beyond any reasonable hurt. An unknowable hurt. We cried until we didn’t think we could cry anymore. We cried some more. Then eventually, we realized – we must begin again. And life beneath our roof waited patiently as we fell in love with life again. It’s been almost seven years now, since that day that’s indelibly etched into our heart strings. Forever written into every tomorrow. That which I cannot change. And while there are, still, somedays that grief takes us rigidly by the hand for a walk we don’t want to go on. Those grief walks of ours – both hard and exhausting, yet enlivening and curative, have allowed us to see the world in a unique way: with a broader scope and a deeper sense of love. By emptying ourselves of the darkness…the mourning, we’ve been led down a path of, mostly, peaceful grieving. For with every exquisite step we become filled with a little more light. This exercise in love and loss – grounded by the very roots from the “trees of life” we have touched along the way, is ultimately what helped us to raise our roof a little higher and open our hearts a bit wider with each passing year. Wherever you are in your Storybook of Life, may you find enlightenment, friendship and courage as you navigate through the universe beneath your roof. Whether you’re feeling a huge void underneath your roof, or your roof and your world seem overwhelming. It won’t crush you. I promise. Remember that each moment is as fleeting as a feather carried on a swift breeze, one moment floating lazily in front of you, the next, quickly scattering in the wind to a destination unknown. When you Raise The Roof. Raise it high! Celebrate every last thing that lives and breathes beneath it. As the brilliant, Mary Oliver once asked, “Tell me, what is it you plan to do with your one wild and precious life?” Well, Mary, I plane to LIVE IT – each precious day… boldly, passionately and lovingly. This entry was posted in Courage, Death, Loss of a Child and tagged cerebral palsy, courage, craftsman style home, death, disabilities, Empty nest, enlightenment, family, Inspiration, loss of a child, Love, Mary Oliver., NESTpirations, raise the roof, Starting over. Bookmark the permalink. 27 Responses to RAISE THE ROOF! Karen- My utmost heartfelt sorrow in hearing your account of Preston’s passing. Your telling of it and how your family felt afterward was so very powerful. I am glad that you and Sam and Samantha have seemed to find some peace. I know you will be an inspiration to others and help them to find the courage to again, “raise the roof!” God bless. Thank you so very much for extending your sympathy to our family. This blog is in preparation for sharing so much more in my book. Not just disabilities, death and loss. But joy in accepting what we were given and a celebration of diversity. I hope you are finding the things that fill your soul beneath your roof! God always knows what we need! As I’m reading this post, I realize you are describing exactly how I feel having my own “empty nest.” Just seeing the school buses makes me long for those days. I miss them so much! God does have such perfect timing by blessing me with a beautiful grand baby that is the joy of my life! Tina, Congratulations on your grand baby – what a blessing, indeed! As my father used to say “Too soon too old, Too late too smart! If we only knew then, what we know now. But what fun would that be! That’s what life is all about…being open to receive, to learn, and of course, to love. Love received and much appreciated…BIG thanks! It was one year ago today that my fingers nervously prepared to hit the publish button. I chose this piece, “from the cellar,” because it best sums up our life and most accurately describes our life philosophy. It’s been so wonderful getting to know all of you and hearing YOUR fascinating life stories. I hope you enjoy the read! I just found this blog post, and read each word lovingly and with great sorry, and great happiness that you and your family were able to leap from the place of pain to a place of joy, always loving and missing Preston, but going on with the life inside and ahead of you. I applaud you all, and I’m in awe. I can’t even begin to tell you how beautiful I find your writing and the sentiments behind it. Your spirit is an indomitable one and I admire you for it. We each should remember to make the most of those moments in life..
We spend far too many of them holding onto the none important things in life.. Your “Story of Your Life” really has a lot of tragedy within it, Karen. I am so glad you can look back and laugh at your empty feelings when Samantha left for college. It is a dramatic exit, but in your case, one that ended happily. As far as Preston, seven years ago, must still feel like yesterday, so indelibly etched is the unspeakable loss of a precious son. You endured; but just barely. I cannot imagine this, but must feel that it means a lot to know you did a lot of wonderful things with him, along with Samantha. Memories are bittersweet, my friend. As far as your home and the metaphor given here, I agree with it completely, Karen! Life your life! Raise the roof! Make it a ‘barn dance’ or a ‘quiet waltz,’ but enjoy your new home! It looks like such a lovely setting, Karen! I think this will be a peaceful, beautiful homestead where you will not want to leave! I cannot wait to see your office space and glad you will be able to ‘unpack’ your life, very soon! My deepest condolences for your family and the loss of Preston. I will take your words of wisdom and encouragement and strive to do exactly those things. Every single day. Ah, thanks Colleen! I get the feeling that you already to a pretty good job at that already. Your post touched my heart deeply. I don’t even know how to express my sympathy for your loss other than to say, I am so sorry and thank you for sharing your words and your experience. We emptied our nest and now we have one that is back temporarily while he gets on his feet post college. I didn’t want to see my kids go, but now one’s back? Change gears again. On another note, my dad grew up in Gloucester, Va. Most of his family still resides there. It’s a beautiful part of the country. Thanks so very much, Becky! Life does seem to be about changing gears doesn’t it? It took some getting used to but I love our empty nest now though! Karen, I came over here to say thank you for the follow, but was totally dumbfounded by this piece of writing. It’s incredible how you managed to capture so many emotions and put them here for us to share with you. It’s also astounding how you and your husband were able to pick yourselves up and find new strength to move forward after Preston. So many people get stuck when something unexpected happens, be it a small thing like a move or a big thing like Preston, but not you…you’re a shining example of what it means to LIVE. Thank you for finding me! I can’t wait to read more of your posts!